Today was a day both Deborah and I have been looking forward to, but Deborah didn't know that today was the day. We've been looking forward to marriage for some time, but, being of a somewhat conservative cast of mind, I wanted to wait until her divorce was formalized with the return of her maiden name before I proposed to her. I also wanted to surprise her. I did. 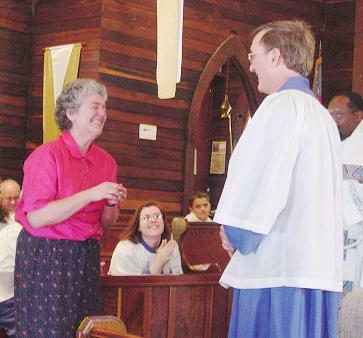 Yes, I proposed to her, in my choir robes, in the middle of church, in the middle of the service, between the Liturgy of the Word and the Liturgy of the Eucharist, after the announcements and blessings. It was the only way I could be sure of surprise—and it was nice to have it witnessed by my faith community, of which Deborah is becoming a "flying buttress" (being a Jew, she supports it from the outside). Father Keith was a delighted co-conspirator, as was Donna, the parish secrectary, who took these pictures. This is a busy day for our parish family: one of endings and beginnings. A few minutes ago we celebrated the ending of little Elijah's unregenerate life and the beginning of his new life in Christ. 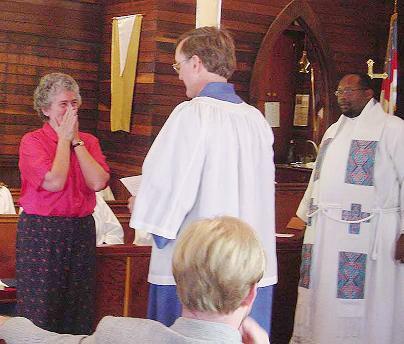 This afternoon we say farewell to Alice and celebrate her entry into her new life among the blessed. And so Deborah and I would like your help to celebrate the end of loneliness and the beginning of a new life together. Being also one with poetic pretensions, I spoke my proposal as a sonnet, giving her my maternal grandmother's wedding ring at the ultimate couplet. Are intertwined as close as bone to bone. A first knot in our tapestry divine. We found a destiny we’d judged absurd. Deborah, will you be my wife? Great poetry it is not, but it had the desired effect—although, being speechless, she could only nod at first. Unfortunately, Donna didn't catch my compliance when Deborah found her voice and asked "Aren't you supposed to be kneeling?" We haven't set the wedding date yet, although it will likely be in the fall when the San Lorenzo Valley starts to cool down. We're looking forward to blending our two traditions in the ceremony—and making a joyous noise in the process!